Guilin is a famous tourist destination in the South-West of China. The city has more than 1 million people. The scenery near Guilin is world famous. 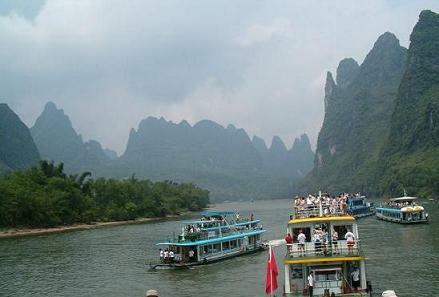 Top attraction is a cruise on the Li River from the city Guilin to the village Yangshuo. The port of embarkment is Zhujiang wharf, 31km from Guilin. A taxi from Guilin to the wharf is 60 Yuan. 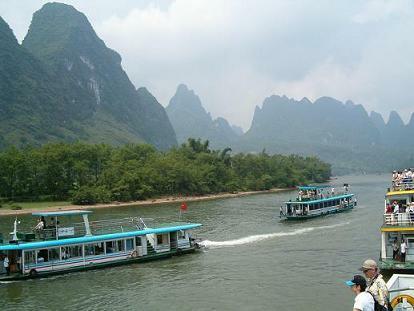 The cruise to Yangshuo takes about 4 hour. The cruise boats have open decks and offer stunning views on the karst hills. A bus takes passengers back from Yangshuo to Guilin (if your hotel in in Guilin). Boat tickets are sold by hotels and travel agencies. The tickets vary in price. Is the bus to the boat included? Is a meal included on the boat? Yangshou is surrounded by the karst mountains and is a popular hangout for tourists to stay overnight. There are lots of guesthouses, hostels, shops, restaurants and entertainment. Visitors can hire a bicycle (10-20 Yuan per day), do rock climbing, hiking, visit one of the local caves or just sit on one of the terraces. Distance to Guilin is 60km. Liangjiang International Airport is 28 kilometers from Guilin. International flights to Japan, Korea, Malaysia, Singapore and Thailand. Airport bus to the city is 20 Yuan. Taxi is about 80 Yuan. A taxi to Yangshuo is about 200 Yuan. Guilin has 2 train stations – North Station and South Station -. South Station is considered as Guilin Railway Station with the most convenient location. The start price is 8 Yuan for the first 2 km from 6.00 to 23.00. Then 2 Yuan/km. At night the rates are slightly higher. The Chief Bus Station is at Zhongshan Road close to the Guilin Railway Station. Most buses to surrounding cities leave from this bus station. Also the coach buses for Yangshuo depart from the Chief Bus Station between 07.00-18.00 The journey takes 70 minutes. Fare is 14 Yuan. Smaller buses to Yangshuo leave from Guilin Railway Station. Travel time and fare are about the same as the coach buses. Hot air ballooning in Yangshuo is quite popular. Prices are about 800 Yuan per person. Many travel websites talk about the beautiful views and experiences of such a balloon trip over Yangshuo. However what you don’t read is that many accidents happened with these balloons the last 6 years in Yangshou. October 2009, 4 Dutch tourists died when their balloon set on fire and the people jumped/fall out the basket.